Unique little cookies, these double crunchers with fudge filling, don’t you think? I can easily say I don’t have any cookie recipe quite like them. There is a reader of my blog named Georgia (hey, Georgia!) who is 15 years old (15!) and who does the large majority of the cooking for her family. Are you wondering what I’m wondering? How do I get a Georgia in my life? Anyhow, Georgia sent me the recipe for these delectable cookies after noticing I didn’t have anything like them and urged me to put them at the top of my to-try list. I made them that night. I have so much self-control. I know. And let me tell you, these are incredible. 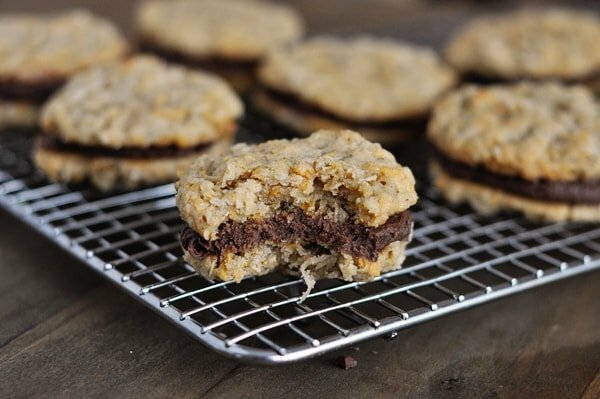 What you’ve got is basically an ultra-chewy cookie loaded with texture: crunchy cornflakes, hearty oats, and flaky coconut. You take two of these buttery, golden, cookies (so-good-I-nearly-ate-them-on-their-own-sans-filling) and shovel a huge dollop of decadent yet simple fudge frosting in the middle, sandwiching everything together with a quick squeeze. And then you die. From the burst of absolutely unreal cookie flavor and deliciousness. You want a wow factor? Make these. You want the ultimate cookie experience? Make these. You want a cookie that will solidify your status as a rockstar in the kitchen? Make.These.Cookies. In a large bowl (of a stand mixer or with a handheld electric mixer), cream together the butter and both sugars until the mixture is light and fluffy, 2-3 minutes. Add eggs and vanilla and mix to combine. Stir in the flour, baking soda, and salt. Add the oats, cornflakes and coconut. Stir until combined. Shape the dough into 1-inch balls and place about 2 inches apart on silpat or parchment-lined baking sheets (or lightly greased baking sheets). Bake for 10 minutes until lightly browned around the edges but still slightly soft in the middle. For the filling, melt the chocolate chips in the microwave or on the stovetop over low heat. Let cool to room temperature or just slightly warm to the touch. Beat the cream cheese and powdered sugar together in a medium bowl until smooth and creamy. Stir in the melted chocolate and mix until well combined. Spread frosting on the underside of half the cookies and top with the other half of the cookies (pretty sides facing out). Store in the refrigerator until ready to serve. I found your blog a month ago and have tried a number of recipes since. It has made time in the kitchen more fun! I’ve noticed that you occasionally note the weight of certain ingredients in the recipes and was wondering if you might be able to list the weights more often? It makes for fewer dishes and more accurate measurements. It’s faster too! Thank you for the great recipes. It’s making dinner and desert more fun! Great recipe! For those who have wondered if it would work, I used rice crispys in place of corn flakes and it worked great. I just didn’t crush them. Mel, these look awesome! I am totally going to try them. Can’t wait! I love your description of these. You got me hooked and I can not wait to try them tomorrow! My kids love getting two cookies at once and frosting in the middle will put it over the top in their books. Mel! I made these today with some rice crispies used for half of the corn flakes, and instead of chocolate filling I made a salted caramel buttercream…HEAVEN! Thanks for the inspiration, I’ll be posting soon! Also, Mel- You posted these cookies 4 days ago and I literally thought about them every day until tonight when I finally just gave in. I just HAD to make them so they would stop haunting me! Any clue how long these will stay good in the fridge? Freezer, even? Probably sounds like a silly question considering how delicious they look and sound! (You had me at coconut and chocolate!!). I need to take a treat to someone immediately after being out of town for three/four days. Wondering if I could make these before I go and have them waiting. Any other make-that-far-ahead suggestions from your dessert recipes, Mel? It’s for a friend’s birthday, but doesn’t necessarily need to be cake. Hey Allyson – I think these cookies would be fine in the refrigerator for maybe a day or tow but 3-4 days might be pushing it. If you are wanting a make-ahead treat, I’d suggest a cookie that would freeze well (chocolate chip, oatmeal, etc) or brownies. Brownies can be chilled in the fridge for up to a week and still taste amazing. You are nice friend! OMG – these look amazing! I am definitely going to try them. 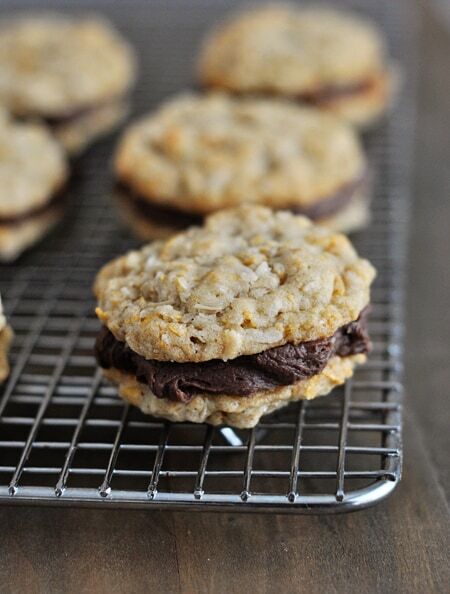 These look SO good, especially that chocolate-y filling! Thank God for Gerogia! These look fantastic! I’ve never seen anything like these cookies before. They look perfect! I love that your readers send you their favorite recipes–how can I get my readers to do that!? LOL! These look great! Do you think crispy rice cereal could be substituted for the Corn Flakes? Also, given the cream cheese in the filling, can these ever sit at room temperature? Thank you! 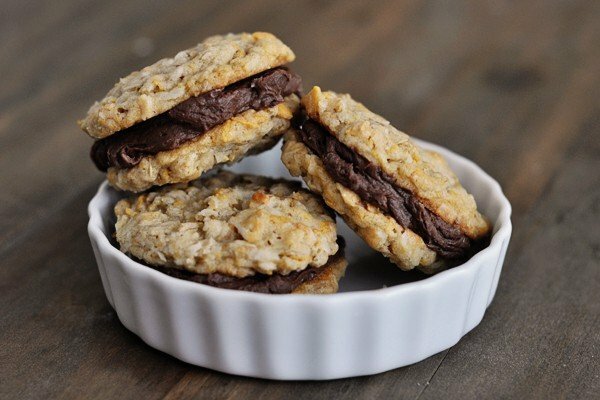 Jocelyn – I’ve never tried these cookies with rice krispie type cereal so you’d have to experiment. 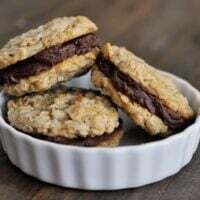 I’ve tried another version of this type of cookie with the rice cereal and didn’t like it quite as well because the krispies don’t stay quite as crisp as the cornflakes. Also, the cookies are fine at room temp for a couple of hours but longer than that and they should probably be refrigerated. Plus, they taste yummy cold. I can’t wait to try these! I love finding different cookie recipes, thanks Georgia for sharing!! So – for those of us who think this recipe sounds devine, if only there were no coconut in it. Any thoughts about substitutions, or changes in the recipe if the coconut were omitted? Thanks Georgia and Mel! Jennifer and Susan – you might try adding more oats to compensate for the lack of coconut. I’m not sure exactly how much – you’ll have to experiment. Good luck! I would like to try these for a bridal shower, but I don’t like coconut. Is there anything I could substitute? These look yummy. Thank you Georgia and Mel! How do I get myself a Georgia? That’s what I want to know. Because I have a feeling, she’d make these any time I asked. Totally jealous!! These look delicious. Just a quick question. How do you melt chocolate chips without scorching them? I have wasted a lot of chocolate chips over the years. It only works for me if I add a little oil and then the chocolate tastes like oil instead of yummy chocolate. Any suggestions? Yum! I sent you a very similar cookie recipe (minus that incredible sounding fudge frosting) a couple years ago, that my Grandma has been making for years and years . They are my favorite cookie! Grandma’s sure know where it’s at when it comes to cookies! ( and pretty much everything else too, lets face it, but especially cookies) can’t wait to try that frosting! I would like them plain. Not big on chocolate unless it is candy. Strange I know!!! Haha!! That fudge filling looks seriously delicious! Love it!